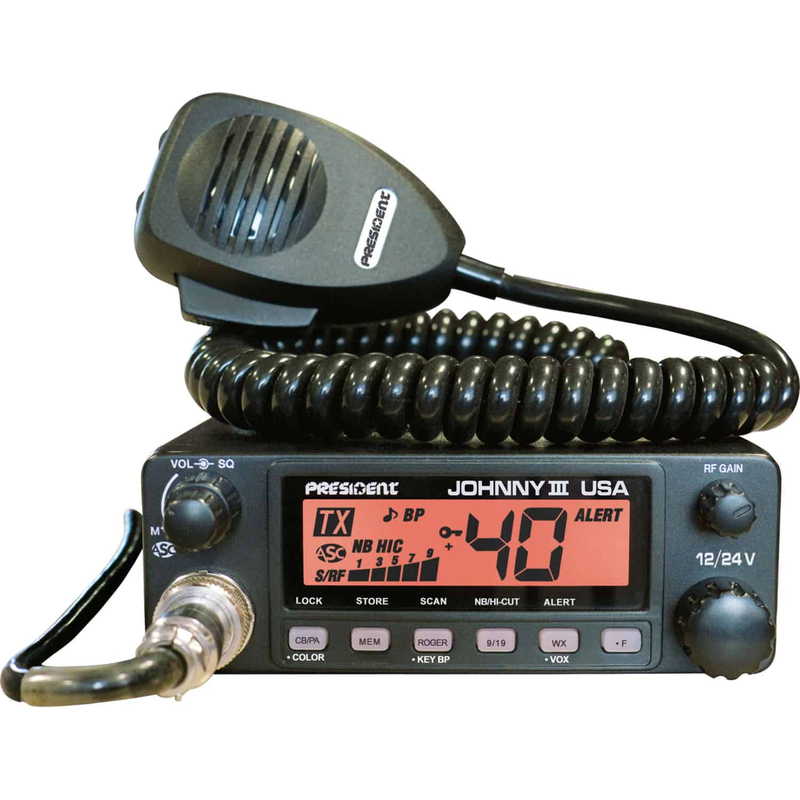 New from President Radios the Johnny III is sure to please anyone who runs their radio installed in heavy equipment. The Johnny III has the unique ability to operate on either 12 or 24 volt systems. The President Johnny III features 3 color panel, VOX, weather reception, and adjustable RF gain. The Johnny III CB includes the most in demand features in a two mobile radio. A selectable 3 color front panel allows for a choice of orange, green, or blue colors. A Large easy to read LCD display shows up for clear status of your radios functions. The VOX voice activation feature provides for hands free use. Roger beep, weather alert, signal meter, rotary channel selector, and a choice of manual or automatic squelch control put you in control of this radio! But there is more, Auto noise limit, hi-cut filters, RF gain complete the feature set of the Johnny III CB radio. The front mount microphone makes for ease of installation in even the most cramped vehicle cabs. And an external speaker jack allows the addition of extra audio power so you won't miss out on the conversation! A full five year warranty is unheard of but is standard with the President Johnny III radio! Please note that this radio does not have a built-in SWR meter. You will need an external SWR meter (like the AUSWR) in order to tune your antenna system for optimal performance. See our Help Center's article How to Tune a CB Antenna for additional information.